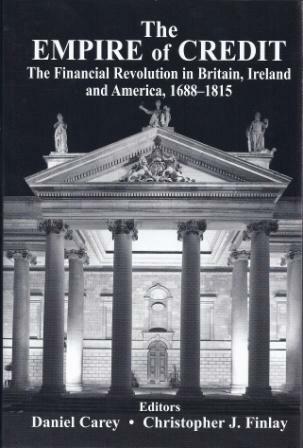 Describes the massive expansion in public debt brought about during the ‘Financial Revolution’ in eighteenth-century Britain, Ireland, and America. Discusses how debt was financed and new credit instruments introduced for the first time in this period. Important parallels with today’s global financial crisis. This volume explores crucial questions arising from the creation of public debt for the first time and new forms of credit in late seventeenth and eighteenth-century Ireland, Britain, and America. The period saw the establishment of national banks designed to finance government expenditure, vastly expanded tax regimes, and the appearance of novel credit instruments (from national lotteries to annuities). Collectively these developments formed the basis of the ‘Financial Revolution’. How differently did these events play out in Ireland, Britain and America? What circumstances governed the development of banking, finance, and trade among the players in an empire formed by credit? In this volume leading scholars in the field discuss rival philosophies of money among the major intellectual figures of the period (including Locke, Hume, and Adam Smith); the role of the state in securing public loyalty through investment in national debt; the continued need for hard currency even as new forms of credit and paper money began to enter widespread circulation; America’s trading relationship with Britain and the crisis in currency after Independence; and Ireland’s distinctive position: the country remained outside the union formed between Scotland and England, yet it was integrated into British and American markets while innovating in finance and banking along lines established in England. Daniel Carey is Senior Lecturer in the School of Humanities, NUI Galway. He has authored and edited a number of previous books on the Enlightenment. Christopher Finlay is Lecturer in Political Theory at the University of Birmingham. Recent publications include Hume’s Social Philosophy (2007).